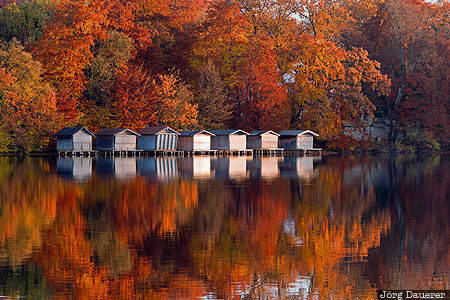 Huts on the shore of Weßlinger See surrounded by colorful autumn foliage and its reflexion in the calm water of the lake illuminated by the setting sun. Weßling is south west of Munich in the county of Oberbayern, Bavaria, Germany. This photo was taken in the evening of a sunny day in early November of 2015. This photo was the image of the month in November of 2016. This photo was taken with a digital camera.